I love bargains and great deals, therefore I almost always book my flights with budget airlines such as Ryanair and Easyjet. On my last trip to Barcelona I found a great deal with Ryanair for only £68 return, so I happily booked my Barcelona weekend break with them. Despite a few delays all my flights went fairly smoothly and I never had any problems. But what happens when the flight gets cancelled? Well, I found out when my evening outbound Ryanair flight back to London got cancelled. I was panicking when I heard the announcement and I was already picturing myself sleeping at the airport. 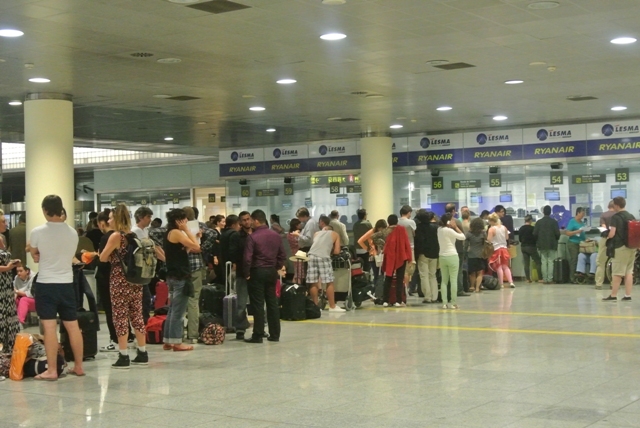 Everyone was running to the Ryanair help desk and when we arrived, there was already a big queue. Apparently, this wasn’t the only flight that got cancelled, so we patiently had to wait until it was our turn. The reason for the cancellation: the French air control was striking again. After an hour waiting we got told that we’re able to get an alternative flight Thursday morning – that meant we had to extend our stay for 2 nights. Luckily, Ryanair also organized a hotel and a transfer, so we at least didn’t have to camp out at Barcelona’s airport. With almost no cash on us I was relieved that we got a place to sleep. After another hour waiting we were finally able to board the shuttle bus. It was pitch dark by now and nobody could tell us where they will bring us. I was secretly hoping that we head back to Barcelona, so we could spend another day at the beach. Unfortunately, the bus passed the turn off and drove 30 minutes away from the centre. We arrived in front of a very nice 4 star hotel just after midnight. We still had no clue where we were but at this point I didn’t really care – I just wanted to sleep. 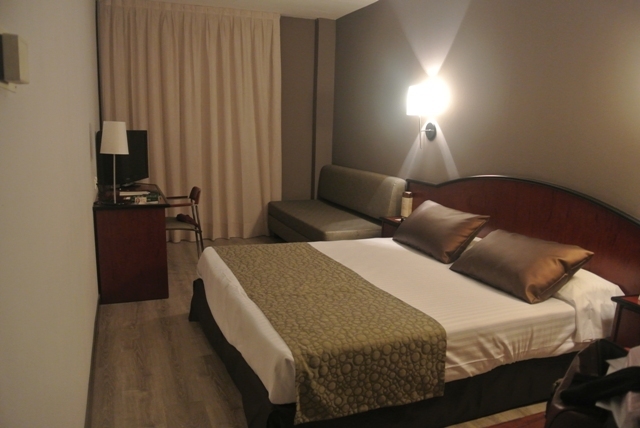 The hotel room was really nice with a flat screen TV, comfy bed and a modern bathroom (I wished we had this room for the whole stay in Spain). We loved it and fell asleep within seconds. First thing in the morning we went to the breakfast area and there was A LOT of food. It was a proper stereotypical British breakfast with sausages, fried eggs, toast but also all sorts of meat, cheese and cereals were available. This was the only paid meal from Ryanair, so people (including us) filled up the plates. I had some cornflakes and a few mini baguettes with lots of different kind of topics. Now it was time to find out where we are. After checking the map we realized that we’re in a city 20 km northwest of Barcelona: Sabadell. It was a beautiful day, so we headed outside to explore the area. 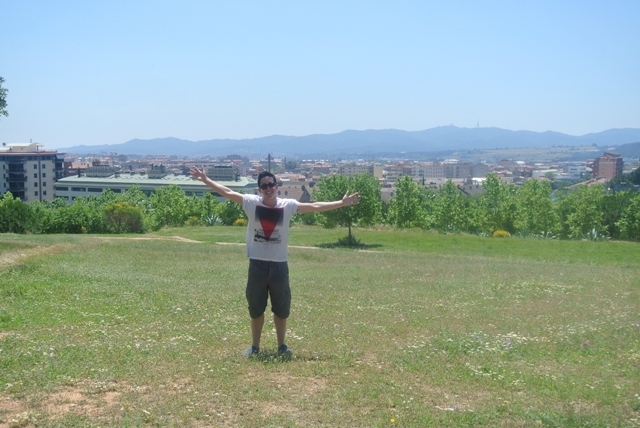 We went to the park, chilled in the sun and enjoyed experiencing the real Spanish life. The streets were empty during Siesta but it got busy again in the evening; and the Spanish food and drinks were extremely cheap compared to Barcelona. On the morning of our departure Ryanair promised to provide the transfer to the airport. When we went the reception at 4am in the morning nobody knew about it (and we kind of expected this). The only option: a taxi. 45 km later and 75€ less in our pockets we arrived at the airport. * The check-in went very smoothly and shortly after entered the plane. A cancelled flight can mix up your schedule, but also gives you the opportunity to get to know your travel destination a little more without spending a fortune as the airline usually pays for the expenses. We quickly forgot about the hassle at the airport and enjoyed our extended stay in Spain. It was great to explore another Spanish city and to have an extra day in the sun. It could have been organised better (e.g. no communication and transfer to the airport), but overall it was a surprisingly good experience with the airline. *Note: We applied for a refund via an online form and shortly after received an e-mail with the confirmation. The cheque arrived ca. 3 weeks later.